While National Teachers Academy supporters, who are fighting to keep their school open for elementary students, hope that the release of this year's school ratings could help their cause (NTA stayed at 1+ and South Loop elementary – the school where CPS is pushing NTA students — dropped to 1), CPS now says the decreased rating of South Loop doesn't matter, according to the Chicago Sun-Times (see article below). The Chicago Board of Education is closing NTA and plans to move its students to South Loop elementary in order to take the NTA building and turn it into a neighborhood high school, even though there is already a neighborhood high school. The situation is reminiscent of 1999, when the Board closed another excellent South Loop school that served a majority Black and Latino population, Jones Commercial High School, in order to use its building for a different school that would appeal to white residents of the area. The same issue is also playing out now in the West Loop and on the Northwest side, where the Board is building new, unneeded high schools for white residents who don't want to send their students to their neighborhood schools, which serve a majority of Black and Latino students. White students make up only 10.5 percent of the Chicago Public Schools population, but most of the capital funding is spent in areas where white students go to school. See a 2016 report by WBEZ, "How Chicago School Construction Furthers Race and Class Segregation," for a breakdown of spending that year. Board policy passed at the October 24, 2018, school should halt plans in the West Loop to build another neighborhood school when residents are in the district of the under-enrolled Wells High School.In an apparent nod to how it is wasting millions and sabotaging existing schools as it increases segregation, the Board of Education passed a policy at its October meeting which – if the Board followed the policy – would halt these moves. The policy states that it would "cease any potential plans for school expansion that may negatively impact enrollment at the under-enrolled school." In the South Loop, West Loop and Northwest Side, where expensive schools are unnecessarily being created, neighborhood schools Phillips, Wells, and Steinmetz high schools are under-enrolled and will decrease further with the new schools. 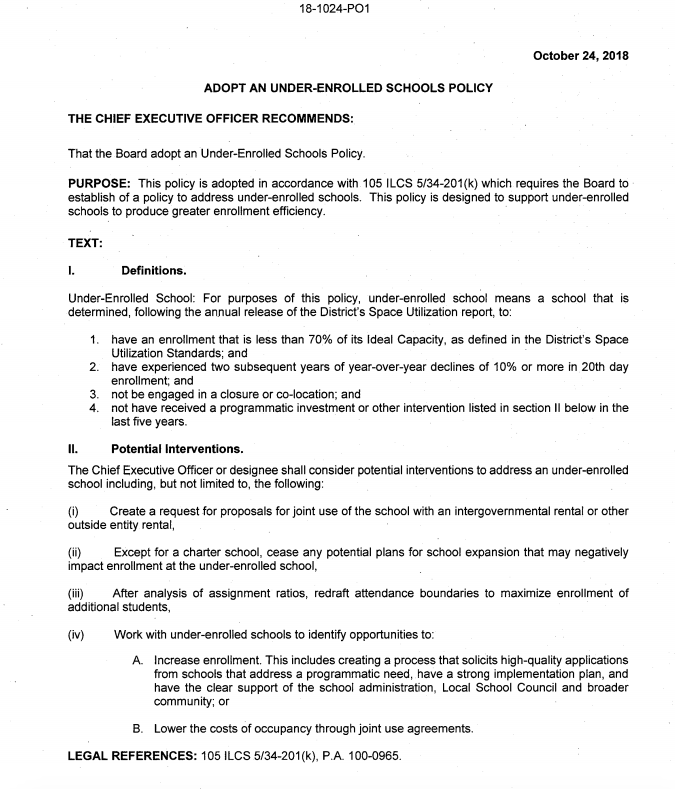 However, just as it made promises about the school quality ratings, which it will disregard, the Board may likely ignore its new policy about under-enrolled schools. The below, Oct. 26, 2018, Sun-Times piece reports on the ratings policy issue in the South Loop. Could new CPS ratings halt South Loop H.S., save National Teachers Academy? New Chicago Public Schools ratings released Friday, Oct. 26, 2018, are threatening to derail a controversial plan to open a high school at the South Loop site of a top-performing elementary that would be shuttered under the plan. CPS officials have assured parents for years that they wouldn’t close a school unless its students were guaranteed a place in a higher-performing school. National Teachers Academy parents were told the same when they were assigned to South Loop Elementary as NTA closes to make way for a new high school in the booming South Loop. But the updated ratings unveiled Friday show that South Loop Elementary has fallen a level according to the School Quality Ratings Policy — from the top rating, Level 1+, to Level 1, while NTA remained at Level 1+. NTA’s parents, who’ve waged a fierce battle against the closing at public hearings and through a lawsuit filed in Cook County Circuit Court, hope the news saves their school from a closing one grade at a time as the proposed new high school welcomes its freshman class in September. She said that during one of the court hearings, CPS attorneys justified the merger of the schools, then both with Level 1+ ratings, by showing that South Loop had more underlying points. District spokesman Michael Passman said officials have no plans to change course.